Before I left on my expedition to the South Pole I got a lot of advice from people. Biking to the South Pole is a seemingly impossible task. I assume these people were honestly concerned about my welfare. This is part nine of nine posts looking at some of the advice I was given. In the last post I talked about the advice that Mike gave me. 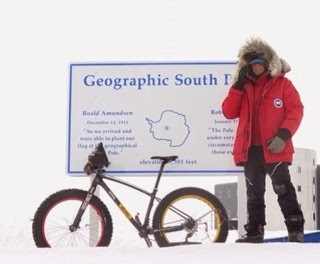 Mike said he spent 6 years plotting and working towards an attempt to bike to the South Pole. In the end, he did not take the shot. He was much more experienced than I was, and many considered him much more worthy of the challenge. But he decided that the goal was not worth the effort and decided not to attempt to bike to the South Pole. In the end he missed the shot because he did not take it. Yes, I was not as experienced, but in the end I made it because I took the shot. Don't be afraid to make the effort.